MGM Resorts has been the surprise winner in the gaming industry lately. Here's how it beat once-high flying rivals. Three years ago, MGM Resorts International (NYSE:MGM) was arguably one of the weakest stocks in the gaming industry. It was highly leveraged, had very little exposure to the fast growing Macau market, and the massive CityCenter resort was struggling to gain traction. Since then, MGM's stock has outperformed rivals Wynn Resorts, Limited (NASDAQ:WYNN), Las Vegas Sands Corp. (NYSE:LVS), and Caesars Entertainment Corp (NASDAQ:CZR). And there's a good reason why. The reason Wynn Resorts and Las Vegas Sands have fallen in the last three years is Macau. You can see below that gaming revenue has declined rapidly in the world's biggest gaming market, and both gaming giants get most of their revenue in Asia, so the drop makes sense. Data source: Gaming Inspection and Coordination Bureau. Chart by the author. What's more, it's not really clear the future in Macau will get much better. Gaming revenue has started to grow slightly, but six new resorts or expansions either have opened or will open soon, including recently opened resorts from Wynn and Las Vegas Sands. When MGM opens a resort on Cotai next year it could be entering an already saturated market. The Macau exposure that was once a strength for gaming companies has been a liability the last few years, at least from a stock performance perspective. While Macau has struggled, Las Vegas has been extremely steady for gaming operators. Gaming revenue on the Las Vegas Strip has been in a range of $6.1 billion to $6.5 billion annually since 2011, including $6.3 billion in the last twelve months. MGM Resorts generates a vast majority of its revenue from Las Vegas, so the steady operations there have buoyed the company in comparison to Asian-focused competitors. 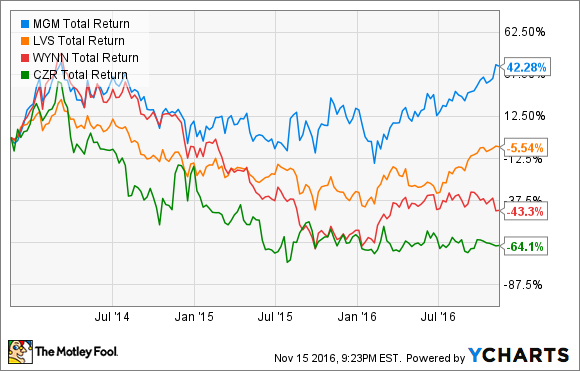 The third thing that's helped MGM outperform rivals is its declining risk. 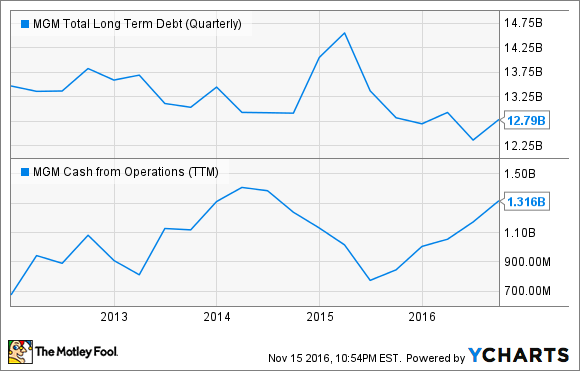 During the financial crisis the company nearly went bankrupt, but over the past five years it has steadily reduced outstanding debt. The company is still highly leveraged, but it's generating more cash from operations than it was a few years ago, and the falling debt load means the business overall is less risky. There's still work to do paying down debt to a level that's sustainable if there's another downturn, but MGM is making progress. As competitors see operations deteriorate, we can see that MGM is heading in the right direction.